Two of the sessions were also broadcast via Hangouts On Air. In the first session, Deepak Khandelwal, Vice President of Global Customer Services and Sophie Bromberg, Director of Online Help, discussed the progress that AdWords customer support has made in the past year in helping to make Google a better company for Small-Medium Businesses (SMBs) to do business with. In the day's second session, a panel of members of Google's SMB team answered questions on the future of AdWords support and advertising. They discussed opportunities to use technology to make customer support more streamlined and customized, as well as emerging advertising opportunities in mobile, video, and social. On the second day we honed in on the topic of online Communities. The program included workshops on content writing as well as breakout sessions for individual markets where Community members had the opportunity to help shape the future direction of the market-specific Communities. 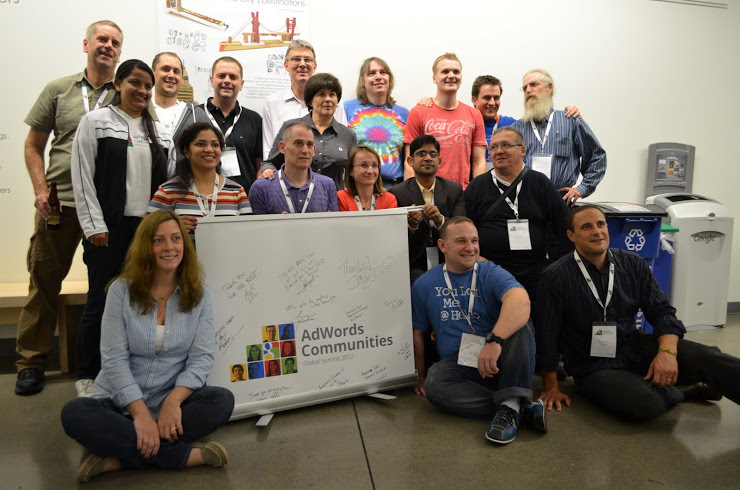 Visit the official Google AdWords Community to meet our experts and join the Community! 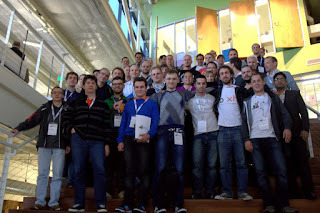 The AdWords Communities Global Summit 2012 took place on October 16-17th at Google’s Headquarters in Mountain View, California. This event brought together over 50 of the most prolific contributors to the AdWords Communities from 20 countries. 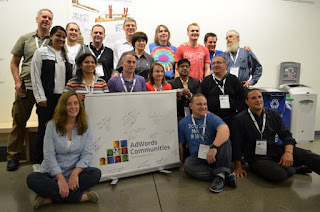 These experts deserve a heartfelt thanks for selflessly investing their time in providing guidance to other advertisers on the AdWords Communities forums. The Summit brought together Google’s Small and Medium Business (SMB) and support teams, product managers, as well as external speakers for two action-packed days covering the evolution of AdWords customer support in the digital age and the future of online Communities at Google. , an efficient new way to target relevant searches with ads generated directly from your website. Now, after a year of refinements and successful beta testing, we’re making Dynamic Search Ads available to all advertisers in the next few days. 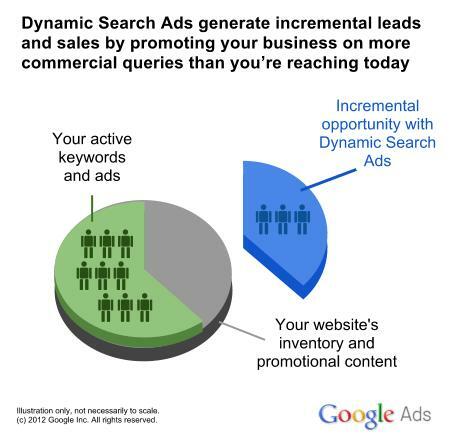 If you’re not already familiar with how Dynamic Search Ads work, you may want to read about the targeting controls available, reporting and optimization features, and support for third-party PPC tracking. Website crawl frequency. Any indexed page with a matched DSA impression will be crawled at least once daily (update: please see clarification below). Pages with more impressions and clicks may be crawled more frequently. So DSA will now better reflect the latest products and inventory conditions on your web site. That means more clicks, higher conversion rates and better ROI. Because of our own prioritization to crawl pages with more impressions and clicks more frequently, as well as other potential limitations on crawl frequency determined by your web host or internet service provider, there may be some indexed pages with a matched DSA impression that are not crawled each day. We’re sorry for any mixup this may have caused. Last October we introduced Dynamic Search Ads, an efficient new way to target relevant searches with ads generated directly from your website. Now, after a year of refinements and successful beta testing, we’re making Dynamic Search Ads available to all advertisers in the next few days.
. With iOS conversion tracking, marketers can better understand which campaigns are most effective at driving app downloads. These enhanced insights help marketers iterate on app promotion strategies to reach their return on investment goals, with the help of features like the Conversion Optimizer for apps. Figuring out what ads are working is key for marketers like Sho Masuda, Vice President of Player Marketing for GREE, a leading mobile social game app developer. GREE has used click to download and in-app advertising solutions with AdWords to promote their app, and Masuda says, "Google’s host of tracking and optimization tools help us quickly iterate and maximize ROI across our app promotion campaigns. iOS conversion tracking will help us gain even deeper insights into our Google app promotion efforts for our iOS apps. recording of our Learn with Google webinar “Understanding your App Users with Google Analytics” here. Apps are a powerful way to keep your most loyal users engaged, and can also be a real driver of revenue for marketers big and small. When advertising apps, the key is to know what’s working and what’s not. While advertisers have already been able to measure their Android app downloads within AdWords, we’ve now launched the ability to track iOS downloads that were driven by in-app display ad campaigns. or Enhanced CPC can help you get more conversions at lower cost, and reduce the time required to manually optimize your bids. When using either one, changing your ad rotation from “Optimize for clicks” to “Optimize for conversions” increases conversions by an average of 5%. That’s because “Optimize for conversions” shows your higher-converting ads more often. To help you get better performance with AdWords, we’ll be linking these options more closely together in a series of changes that we plan to roll out during the week of November 12th, 2012. New ad rotation default when using Conversion Optimizer or Enhanced CPC. When you first activate Conversion Optimizer or Enhanced CPC in a campaign, your ad rotation setting will change to “Optimize for conversions” by default. We recommend this setting to get the most conversions, but you’re free to change to a different option. Eligible campaigns will switch to “Optimize for conversions.” As we announced last December, all campaigns using Conversion Optimizer or Enhanced CPC which are set to use “Optimize for clicks” will be switched to “Optimize for conversions.” You can opt out of this update via this form up until November 9th, but you may miss out on getting more conversions by doing so. Update: The migration of eligible Conversion Optimizer and Enhanced CPC campaigns will now occur during the week of 11/26. “Rotate evenly” change for campaigns using Conversion Optimizer or Enhanced CPC. As we announced earlier this month, campaigns set to “Rotate evenly” automatically begin to optimize for clicks when ads in an ad group are unchanged for 90 days. Similarly, when using Conversion Optimizer or Enhanced CPC, campaigns set to “Rotate evenly” will automatically begin to optimize for conversions when ads in an ad group are unchanged after 90 days. After these changes roll out, you’ll still have control over your ad rotation settings and can make changes at any time. To learn more about the Conversion Optimizer and Enhanced CPC, you can watch the following short videos. For more details on ad rotation, please visit the AdWords Help Center. Using AdWords Conversion Optimizer or Enhanced CPC can help you get more conversions at lower cost, and reduce the time required to manually optimize your bids. When using either one, changing your ad rotation from “Optimize for clicks” to “Optimize for conversions” increases conversions by an average of 5%. That’s because “Optimize for conversions” shows your higher-converting ads more often. There's a good reason so many business surveys include this question: understanding how people connect with your business is important. When people search for local businesses on Google, they may want to check out a website, but there's a good chance they'll want to just give you a call. That's why we initially launched call reporting for AdWords customers—to help businesses use search to connect with people over the phone. Now, we're expanding this feature to AdWords Express customers so local businesses can benefit as well. Call reporting allows you to quantify the offline value of your ads by seeing how many phone calls your ads generate. Follow the ‘RSVP here’ link to visit the associated Google+ event page. The Hangout On Air live stream videos will be embedded in these pages a few minutes before the beginning of each session. Thanks, and again we apologize for any inconvenience. As the digital media landscape continues to evolve, there are a series of new opportunities to engage with users. How has this transformed the nature of AdWords customer support? At the AdWords Communities Global Summit, taking place October 16-17 at Google’s headquarters in Mountain View, California, several prominent Google speakers will attempt to answer this question. On Tuesday October 16, the first day of the Summit, we will be broadcasting the morning’s sessions via four Google+ Hangouts On Air hosted on the Google Ads Google+ page. Follow the ‘RSVP here’ link to visit the associated Google+ event page. The Hangout On Air live stream videos will be embedded in these pages a few minutes before the beginning of each session. Juggling expenses across different credit cards and managing seasonal business spikes and valleys doesn’t leave much room for other spending, like investing in a new oven at a pizzeria or treating a great customer to dinner. In the UK, AdWords Business Credit will have a variable 11.9% APR Representative. In the US, AdWords Business Credit will offer an APR as low as 8.99%*, the same rate as in the pilot. Neither card will have annual fees, and they will both have an ample credit limit for AdWords. We’re teaming up with Barclaycard, part of the Barclays group, in the UK and Comenity Capital Bank in the US to issue the card. Both are MasterCard cards. AdWords Business Credit can only be used for AdWords advertising purchases. Every day, AdWords enables more than one million businesses, the majority of which are SMBs, to connect with their customers online. We hope AdWords Business Credit will give Small and Medium Sized Businesses more flexibility—some ‘extra credit’—so they're able to focus on growing their businesses even further. *Depending on creditworthiness, rates range from 8.99% to 18.99%. Small business owners are used to being pressed: for resources, for time, and especially for credit. Juggling expenses across different credit cards and managing seasonal business spikes and valleys doesn’t leave much room for other spending, like investing in a new oven at a pizzeria or treating a great customer to dinner. , which will arm you with the tools you need to get the most out of your holiday ad dollars. We’ve got a special series on remarketing as well as a few holiday-specific strategies to help you navigate the season successfully. Over the next couple of months, 20 webinars will teach you tips and how-to’s to help make the web work for your business. , you know how useful it can be to help you make better decisions and improve your online marketing. Now, we’re making it possible to use your Google Analytics data right in AdWords. After setting up AdWords to import your Google Analytics data, you’ll have access to Bounce Rate, Pages Per Visit, and Average Visit Duration columns directly in the AdWords interface. With more performance data available right where you’re managing your campaigns, you can make better informed decisions and improve your AdWords ROI. If you’re already using Google Analytics, you know how useful it can be to help you make better decisions and improve your online marketing. Now, we’re making it possible to use your Google Analytics data right in AdWords. After setting up AdWords to import your Google Analytics data, you’ll have access to Bounce Rate, Pages Per Visit, and Average Visit Duration columns directly in the AdWords interface. With more performance data available right where you’re managing your campaigns, you can make better informed decisions and improve your AdWords ROI. 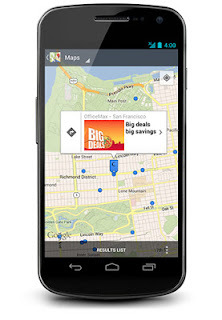 , Google Shopping has been moving to a commercial model built on Product Listing Ads. One of the reasons we decided to make this transition was to get better data from merchants in order to build a better shopping experience for users. We are very pleased with the participation from retailers in our new model and many are starting to report success. Starting on October 17, Google Shopping results in the US will come only from merchants who are Product Listing Ads advertisers. We will be ranking these results based on relevance, with bidding as an additional factor. The ranking of natural search results on Google.com will not change. For merchants who have not yet made the transition, it’s not too late to get your products on Google Shopping and optimized in time for the holiday season. You can do so by signing up for Product Listing Ads; please visit www.google.com/ads/shopping for more information. For merchants attending SMX East in New York City this week, we would love to hear from you during the Google Shopping Q&A session on October 4 at 2:30 PM local time. We look forward to making ourselves available to answer any questions you may have regarding Product Listing Ads on Google Shopping. For help optimizing your Product Listing Ads, check out our Google Shopping best practices guide or watch our optimization video. Additionally, we’ll be hosting a ‘Bidding Strategies for the Holidays’ Hangout on Air on Monday, October 29 at 10:00am PST. Visit the Ads Google+ page to join the Hangout. We’ve gotten a lot of requests for tools that make it easier to manage campaigns at a more granular level, so we’re pleased to announce the availability of product level bidding. This addition to the Product Listing Ads toolkit will help merchants during the holiday season and beyond in a number of ways. Optimize bids for individual products. 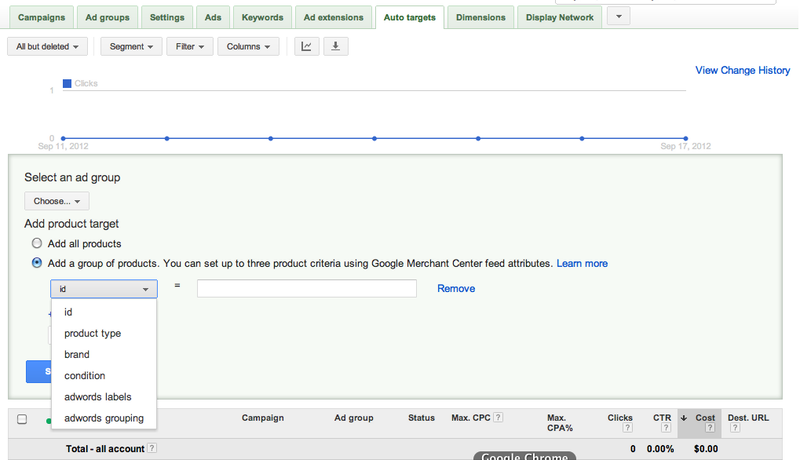 You can now improve your Product Listing Ad performance by setting your cost per click bid at the item level. This functionality should help you meet your volume and profit targets at the product level. Easily create product targets. It is now possible to create product targets using the product ID in your Merchant Center feed to manage your bids at the product level. We believe this feature will create new opportunities for optimization by allowing you to easily target individual products, and will help you make the most out of your Google Shopping campaigns. 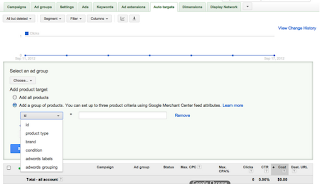 For more information on product targets please visit the AdWords Help Center. We look forward to releasing more tools and features in the coming months to help you reach new customers on Google Shopping. Stay tuned! Over the last 4 months, Google Shopping has been moving to a commercial model built on Product Listing Ads. One of the reasons we decided to make this transition was to get better data from merchants in order to build a better shopping experience for users. We are very pleased with the participation from retailers in our new model and many are starting to report success. will get some improvements to give you better insights, including new columns and hour of day segmentation. Along with these improvements, we’re also announcing some changes in the availability of certain historical IS data. Filters, charts and rules. You’ll be able to apply filters, see charts, and create automated rules using IS metrics. As we launch these improvements, there will also be some changes to the availability of historical IS reporting data. We’ll also be phasing out the existing columns. Below are the key milestones. Up until February 2013, data will continue updating in the existing IS columns. Once the existing IS columns and data are retired, you’ll only have access to the new IS columns. If you rely on historical IS data for reporting or decision making, please plan ahead and take action before November. To preserve an offline copy of your pre-October historical IS data with the existing columns, you must download all desired reports before the start of November 2012. After early November you’ll only have historical IS data for the existing columns going back to October 1, 2012. We’ll post again around the time of the November milestone. In the meantime, please contact AdWords support if you have questions.